1862 US Civil War: Major General J.E.B. Stuart's Confederate cavalry fires rockets at Major General George B. McClellan's Union troops at Harrison's Landing, Va.
Lloyd George remained Chancellor of the Exchequer through the early years of World War I. In 1915, he was appointed minister of munitions in Asquith's wartime coalition government. In July 1916 he became secretary of state for war, but was increasingly critical of Asquith. In December 1916, with the support of the Conservative and Labour leaders, he replaced Asquith as prime minister. Lloyd George's achievements in the last two years of the war included persuading the Royal Navy to introduce the convoy system and the unification of the Allied military command under the French general Ferdinand Foch. At the successful conclusion of the war, Lloyd George was Britain's chief delegate to the Paris Peace Conference that drafted the Versailles Treaty. Balkans: A reconstituted Serbian army of about 118,000 men arrives by ship in the Balkans, and with additional reinforcements rises to more than 250,000. On 3 July a reconnaissance patrol from the 18th (Eastern) Division ranged two miles into German territory without encountering an established defensive position. However, the opportunity was missed or the British lacked the resources to exploit it, and the Germans were able to fill the gap in time. Mametz Wood was still vacant on 3 July, but was re-occupied by the Germans the following day, and would not be captured until 10 July after two costly attempts. Russian Revolution: By the summer of 1917, a social upheaval of vast proportions is sweeping over Russia. Peasants are expropriating land from the gentry. Peasant-soldiers flee the trenches so as not to be left out, and the government cannot stem the tide. New shortages consequently appear in the cities, causing scores of factories to close. Angry workers form their own factory committees, sequestering plants to keep them running and to gain new material benefits. Born in 1844 in Constantinople, Mohammed ascended to the throne in 1909 after the forced abdication of his elder brother, Abdul Hamid, under pressure from . . . a rising political party known as the Young Turkey Party, or the Young Turks. Bent on modernizing the fading Ottoman Empire and stopping European powers from taking Ottoman territory, the Young Turks fomented a rebellion within the Ottoman Third Army in 1908 and forced the sultan to meet their demands and restore the Turkish constitution . . . . The leaders of the [party], particularly Enver Pasha, effectively dictated the course of events over the next decade, as the new sultan, a gentle man, was little able to exert much of his own will on the throne. The results were not good for the empire: over the course of 1912-13, it lost virtually all of its remaining European territory during the two Balkan Wars and an unsuccessful war with Italy over Tripoli. In November 1914, Turkey entered the First World War on the side of the Central Powers—Germany, and Austria-Hungary—against Britain, France, and Russia. 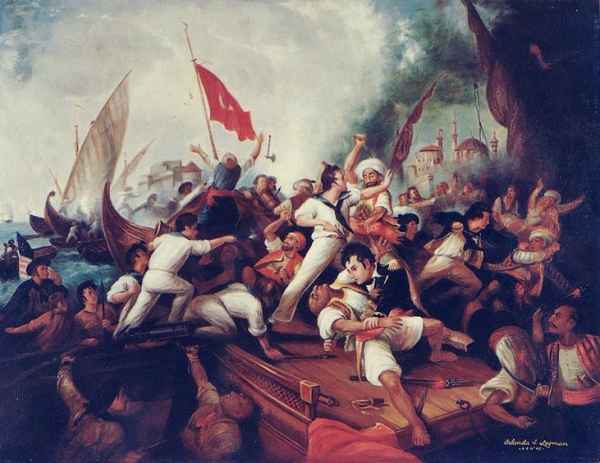 Though he had initially opposed his country s participation in the war, Sultan Mohammed now exhorted his army (as well as all Muslims, including those living in Allied countries), to fight exhaustively against the empire's enemies, proclaiming that "Right and loyalty are on our side, and hatred and tyranny on the side of our enemies, and therefore there is no doubt that the Divine help and assistance of the just God and the moral support of our glorious Prophet will be on our side to encourage us. I feel convinced that from this struggle we shall emerge as an empire that has made good the losses of the past and is once more glorious and powerful." By the time Mohammed V died . . . Turkish forces had endured nearly four exhausting years of war, including a full-scale Allied land invasion of the Gallipoli Peninsula and aggressive Allied incursions into Mesopotamia, and were teetering on the brink of defeat. Within six months of the sultan's death (he was succeeded by his brother, Mohammed VI), Constantinople itself was occupied by the Allies, and the once-great Ottoman Empire was in [ruins]. 1926 Nazi Party: The Second Party Rally begins at Weimar: The Hitler Youth is founded, and the Blutfahne flag is presented by Hitler to the SA. The Blutfahne (Blood Banner or Blood Flag) was the flag of the 5th SA Sturme that was covered in the blood of the Nazi marchers (mainly of Andreas Bauriedl who fell on top of the flag) in the failed Munich Putsch of 9 Nov 1923. Heinrich Trambauer (who carried the flag during the Putsch) took the flag to a friend at Theatinerstrasse 30, where he took the flag from the staff, and left with it hidden inside his windjacket. Later, Karl Eggers asked Trambauer where the flag was, and was given it by Trambauer. Eggers then gave the flag to a man named Graef for safe keeping. Eggers later took the flag back, and possibly left it with a Viktoria Edrich living at Tuerkenstrasse 23. After Hitler was released from Landsberg Prison, Eggers gave the flag to him. It was then fitted to a new staff and finial, and just below the finial was a silver dedication sleeve which bore the names of three martyrs from the Putsch, who had been members of the 6th company: Bauriedl, Heckenberger, and von Stransky. Hitler used the Blutfahne to consecrated new party colors by touching them with one hand while holding the Blutfahne with the other. Church and Reich: Franz von Papen cables German foreign minister, Constantin von Neurath, "In the discussions which I had with Pacelli, Archbishop Groeber, and Kaas this evening, it developed that with the conclusion of the Concordat, the dissolution of the Center Party is regarded here as certain and is approved." Reichrubberstampstag: The German Reichstag retroactively justifies Hitler's ruthless actions against the SA. Ernst Heinkel demonstrates an 800-kph rocket plane to Hitler. Later in the year, the Heinkel 100 will capture the world speed record of 463.919 miles per hour. Molotov received me in the Kremlin, after I had announced my arrival three hours before. Correct translation was secured through Hilger. Molotov's translator failed to appear. I opened the discussion with the statement that on the basis of the talks in Berlin, particularly with the Reich Foreign Minister, I had the impression that we would welcome a normalization of relations with the Soviet Union. The State Secretary had very clearly acquainted Herr Astakhov with our position. Indicative of this position was the following: correct tone of the German press toward the Soviet Union, conclusion of non-aggression treaties with the Baltic countries and our desire for resumption of economic negotiations. Molotov listened attentively and stated that he received this communication with satisfaction. I continued that, since the conversation of the State Secretary with Astakhov, we had waited for a Soviet statement as to what Molotov had meant in his conversation with me on May 20 by the words "creation of a political basis for the resumption of economic negotiations"; I would also have to point out to him that the attitude of the Soviet press in all questions concerning Germany still gave cause for serious criticism. Herr Astakhov had been told that Herr Molotov wanted to answer me personally. Among other things I had come in order to inquire whether he held anything to tell me. In his answer Molotov did not go into the question as to the meaning of the concept "political basis," but he declared that the Soviet Government in accordance with the enunciations of its leaders desired good relations with all countries and therefore-provided there was reciprocity-would also welcome a normalization of relations with Germany. It was not the fault of the Soviet Government if these relations had become bad. 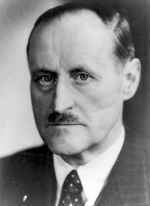 He could not accept the criticism of the Soviet press, since he was not aware of any hostile attitude of the press toward Germany. I replied that much could be said about these questions; that I had not, however, come to talk of the past, but of the future. Thereupon, Molotov asked how we visualized further developments and what changes had occurred lately in the relations between Germany and the Soviet Union. As to the non-aggression treaties, Germany had concluded them in the first place in her own interest, and they concerned only Germany and the countries participating, but not the Soviet Union. Furthermore, he would have to doubt the permanence of such treaties after the experiences which Poland had had. I replied that our non-aggression treaties provided the Baltic countries with additional security, in which the Soviet Union was very much interested. Poland had herself provoked the termination of the treaty with us by behaving irresponsibly and joining a combination hostile to us, which was irreconcilable with friendly relations with us. To this Molotov stated that in his opinion the treaty concluded by Poland with England was a purely defensive instrument. I disagreed and pointed out that the word "defensive" in this connection was of only academic significance. Then I returned to Molotov's question as to how we visualized further developments and said that, in my opinion, the main task in the future would be that both countries avoid everything that would lead to a further deterioration of relations and do everything that might result in their improvement. Germany had no ill intentions against the Soviet Union, and one of the proofs for that was the Berlin Treaty, which we had extended some time ago. Thereupon Molotov asked, "Are you convinced that the Berlin Treaty is really still in force and has not been abrogated by later treaties concluded by Germany?" I replied the following: "I know of no such treaties and have no reason to doubt the validity of the Berlin Treaty." At the end I asked Molotov what he had to say to the question of the resumption of economic negotiations. Molotov replied that he knew the contents of the last conversation between Mikoyan and Hilger. He approved Mikoyan's (group missing) and suggested that we give Mikoyan the desired information. I sought to convince Molotov that it would not be in the interest of speeding up the economic negotiations if details were discussed between Mikoyan and Hilger or me, since we continuously had to request instructions from Berlin. Schnurre, on the other hand, had all the necessary authority, knowledge, and experience and would be able to conclude the negotiations quickly to mutual satisfaction. 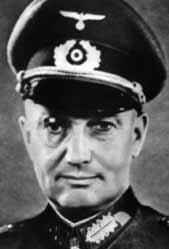 Thereupon Molotov indicated that cancellation of Schnurre's trip in February had annoyed the Soviet Union. They would leave it to Mikoyan, who had mastery of the subject matter, to ask for what he considered right. 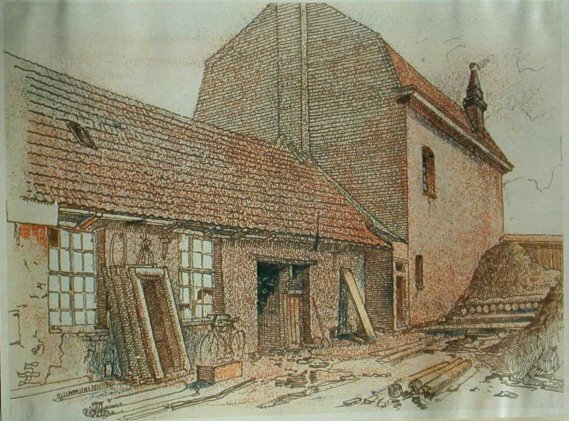 When we had given the information desired by Mikoyan, a trip by Schnurre to Moscow might perhaps prove useful. The conversation closed in friendly spirit and with my repeated request that Molotov influence the attitude of the Soviet press. With the occupation of France, the German aggressor was but a Channel away from Britain. In order to prevent the Germans from using French battleships and cruisers in an attack on Britain, Operation Catapult was conceived: the destruction or capture of every French ship possible. The easiest stage of Catapult was the seizure of those French ships already in British ports. Little resistance was met. But the largest concentration of French warships was at the Oran, Algeria, port of Mers-el-Kebir, where many warships had fled to escape the Germans. This stage of Catapult would prove more difficult. Britain gave the French ships four choices: join British naval forces in the fight against Germany; hand the ships over to British crews; disarm them; or scuttle them, making them useless to the Germans. The French refused all four choices. Britain then made a concession: Sail to the French West Indies, where the ships would be disarmed or handed over to the United States. The French refused again. So the Brits circled the port and opened fire on the French fleet, killing 1,250 French sailors, damaging the battleship Dunkerque and destroying the Bretagne and the Provence. On July 4, British Prime Minister Winston Churchill told the House of Commons that he would leave Britain's actions to "history." On July 5, Vichy France broke off diplomatic relations with Britain. Horia Sima was a provincial high-school teacher, a devoted Legionnaire, regional chief of the Banat, and a friend of several conservative government officials. 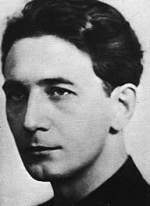 Even before Codreanu's death, Sima took Codreanu's anti-Semitism to a new level and his small underground movement began distributing flyers, beating up Jews, burning their shops and synagogues and eventually, killed a friend of Premier Armand Calinescu, the Minister of the Interior. Though Sima and Codreanu both attempted to stop the murder, it nevertheless took place, and produced harsh consequences. Barbarossa: Stalin speaks to the Russian people over the radio for the first time since the beginning of the German attack on the Soviet Union. Demanding utmost resistance "in our patriotic war against German Fascism", he calls for a policy of scorched earth if the Red Army is forced to yield ground, and the formation of "people's partisan" groups behind enemy lines, as well as the summary execution of all cowards and shirkers. 1942 World War II: North Africa: Due to exhaustion and lack of supplies, especially fuel for the armored divisions, German and Italian forces of the Afrikakorps suspend all offensive operations before El Alamein and begin constructing defensive positions. Unternehmen Zitadelle (Operation Citadel)—the massive German counter-offensive to encircle and destroy the Soviet forces in the Orel-Belgorod salient near Kursk—is delayed by one day because of heavy Soviet air attacks against the German deployment areas. "Cologne," said the briefing officer at one station, "is one of the most heavily defended cities in Germany, and one of the most important. In and around Cologne, are more than five hundred heavy and light anti-aircraft guns, and about a hundred and fifty searchlights, which work in close co-ordination with the gunners. But with this very large force, the belief is that all ground defences will be saturated and overwhelmed. The same should apply to night-fighters. Your track will take you close to several night-fighter stations, but intruder aircraft from Fighter and Army Co-operation Commands and 2 Group will be attacking these stations before and during the raid. Even so, look out for night-fighters. Tail gunners, be careful what you fire at. The terrain, in the area selected for the initial penetration of French soil, was generally level or gently sloping. However, it was broken up into a "crazy quilt" pattern of small fields separated by "hedgerows." These consisted of an earthen mound or wall, 8 to 10 feet in width and 4 to 6 feet in height, covered with a scrub undergrowth. Along the top of this wall grew rows of trees. Forming an important part of the obstacle thus created was the ditch which ran along one or both sides of the mound. The roads, narrow and winding, ran between these hedgerows, and offered the defenders many advantageous positions for ambuscades or surprise attacks on advancing foot-troops and armor. Observation was normally limited from one hedgerow to the next, although an occasional structure, such as the church tower in a village, would widen the horizon. These peculiarities of terrain led to the development of special operational techniques in the application of tactical principles. 1944 Minsk area: Divisions of Heeresgruppe Mitte (Model) are encircled or destroyed by the Soviet 1st and 3rd Belorussian Fronts. The Soviets claim 400,000 German dead and 158,000 taken prisoner. The Secret Diary of Anti-Hitler Conspirator Ulrich von Hassel: [By Wolf Ulrich von Hassel] "On July 3, 1944, my father wrote his last words in his diary. Munich was cut off from train connections by the air raids of those days. In spite of that, my father wanted to go to Berlin, one way or another, for an 'action' was again pending. He succeeded in going north by taking detours." 1945 World War II: War in the Pacific: US troops land at Balikpapan and take Sepinggan airfield on Borneo in the Pacific. In due time a gun Matilda accompanied by a Frog approached one of the enemy positions littering Parramatta Ridge, that had been turned into a Japanese man-made citadel topped with a cunning trench system while underground was a vast intercommunicating honeycombed network of tunnels. The Matilda II's blasted openings into the concrete bunker with its solid shot 2pdr gun and then the Matilda Frog fired jets of flame through the holes. Many tunnel entrances led into the hills and the bypassing of these tunnels would have left the rear open to attack, so CS Matilda tanks demolished the many entrances with 3inch howitzer shells to entrap the occupants then Frogs roared into the dark openings fierce jets of flame. 1946 Cold War: A report, found in the so-called Russian Archives, written by Ivan Serov, the chief of Soviet security in Germany, reveals that 18 German rocket scientists have been found among inmates of the Gulag. The document details steps to be taken for their release in order that they may make a contribution to Soviet rocketry. 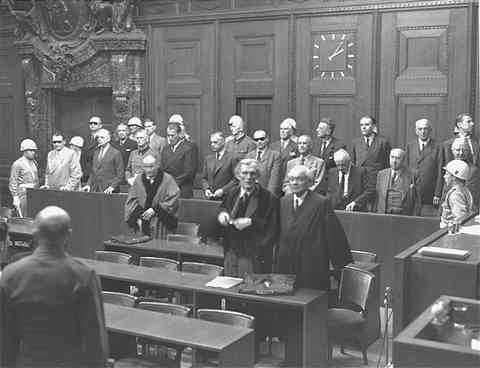 1947 Nuremberg Tribunal: On Day 170, the Tribunal considers various applications by counsel with reference to interrogatories and documents. At this late point in this very long trial, patience is a limited commodity on both sides. Sir David Maxwell-Fyfe: My Lord, it is simply a point of how the compilation of Admiral Assmann should be described. I am quite prepared that it should be described as it is in the original. Sir David Maxwell-Fyfe: Dr. Siemers objected to its being described as a `diary', and said that it should have been described as an index. My Lord, I do not mind what it is described as. The President: What does it matter? Let us call it an index then. Is that all your points? Dr. Siemers: Mr. President, this is important insofar as here in this courtroom many "Tagebucher" have been submitted under the designation of a Diary," and these were really entries made at the time. The President: Sir David says that he will withdraw the word "diary," and you may call it anything else you like. Really, it is only a waste of our time to make this sort of technical point. Sir David agrees with you, and he is prepared to withdraw the word "diary." The President: Very well then, let us not say anything more about it. Dr. Siemers: I quite agree, Mr. President. Mr. President, I do not wish to take up the time of the Tribunal with all the other and very numerous errors in translation. My final speech will show how important this point was in connection with the Assmann document. As suggested by the Tribunal I have brought the other errors in translation to the notice of the General Secretary only. The President: If there are any errors in translation, that matter can be taken up through the General Secretary with the Translation Division. Dr. Siemers, it is very improper for counsel in your position to make statements of that sort for which you have no proof at all. You know perfectly well that when there have been any alleged mis-translations, the matter has always been referred through the General Secretary to the Translation Division and then they have been corrected; and for you to get up at this stage of the Trial and say that there are many mis-translations, without any proof of it at all, simply upon your own word, is a most improper thing for counsel to do, and that is the view of the Tribunal. Dr. Siemers: Mr. President, I beg to apologize, but I think I probably did not express myself correctly. I am not making an accusation, but with so many documents it is not surprising that these errors did occur. I myself make mistakes. I am sorry if my remarks should have been misunderstood. Nikita Khrushchev takes control in the Soviet Union by orchestrating the ouster of his most serious opponents from positions of authority in the Soviet government. Khrushchev's actions delight the United States, which views him, at least in comparison to his rivals, as a reasonable fellow. 1979 West Germany: Statute of Limitations: Thirty-four years after the end of World War II, the statute is amended to exclude murder, thereby enabling the continued prosecution of Nazi war criminals.